Teaches participants how to respond to a wildfire, work as a safe member of a crew to attack and extinguish a fire, participate in mop-up and patrol operations and prepare equipment for the next crew or response. 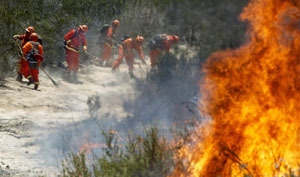 This nationally recognised training course is designed to equip participants with the skills and knowledge on how to respond to a wildfire, work as a safe and situationally aware member of a crew to attack and extinguish a fire, participate in mop-up and patrol operations, and prepare equipment for the next crew or response. This course can only be delivered on sites where a controlled or contained fire can be provided. Please contact us to discuss your training requirements and site conditions. Alex led a very detailed practical component of the Respond Wild Fire course demonstrating excellent command and control on the fire ground. Alex’s training exceeded my expectations.